Here’s your cheat sheet for Gadds No. 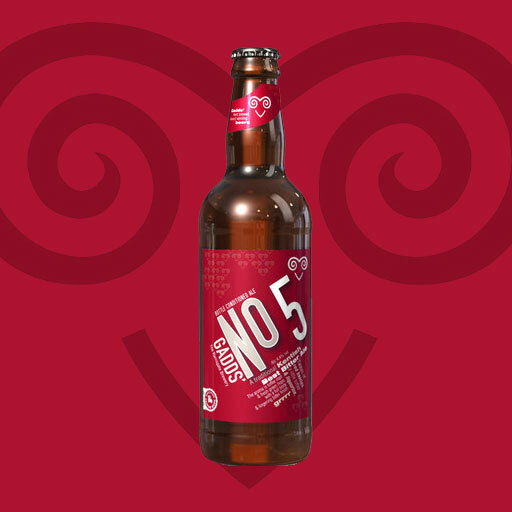 5 by Ramsgate Brewery. It’s #tradbods tonight, with this well-established brewery from Kent. We brew distinctive Kentish beers, using years of knowledge, experience and understanding – we’ve been around long enough to know what we’re doing, and not so long as to be old fashioned. Featured in main subscriber box on 15 February 2018. Long-time BeerBods will recognise the brewery as Gadds No. 3 has featured twice before: once in the main box back in 2013, and also more recently in the beer writers’ dozen box. Find the brewery on Twitter at @RamsgateBrewery and on Instagram at @ramsgatebrewery. Serve this beer at 10°C to 13°C; this means about 40 minutes to an hour in the fridge in real money. This is a traditional Kentish Best bitter. Expect toffee malt and fresh green hops on the nose. The flavour when you taste should feature both again with the addition of red berries and a lingering bitter finish. It should have a full body, with medium malt sweetness and a medium to high hop bitterness displaying a traditional English hop character. The hops used were the classic English Goldings/Fuggles pairing, really characteristic of the Best Bitter style, with a couple of other additions. The brewery suggests you pair this with a Sunday roast, and I’m not going to argue. Read more on this beer from BeerBods and Ramsgate Brewery.